For various reasons since a few years ago Benelux was more an intermediate stop on a business trip rather than a real destination, but recently this has changed: after the Agile Open Holland in Baarn, about which I already wrote, I went again to that part of the world for an agile event: XPDays Benelux in Mechelen. 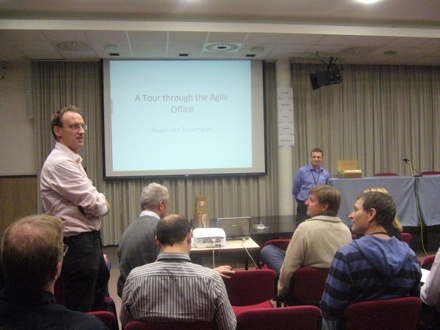 Once again the impression is that agile is very mature here and that the agilists are also walking their talks: in the two days I was there I spoke with many very knowledgeable people and the level of their contributions to the conference, be it in formal presentations or in workshops or simply in the talks during the breaks, was remarkable. The concept of the conference was to mix hands-on programming sessions, workshops on the various aspects of agility and formal presentations, also in quite some quantity: with five parallels tracks there was always something good going on, also for all tastes, and several times I had difficulties in deciding where to go. Highlights? Well, several: from what you can learn when your house burns down (slides) to how to create leaderful teams to tools to coach product owners – the “black hole” of Scrum for how its definition is incomplete. There were also several other very interesting sessions that were rated very well by the participants. I was also presenting my session on how to use solution focused techniques in agile coaching (slides – I will write about it in a follow-up post). On the top of some great content, also the setup of the conference was great: the conference centre was very modern and fully equipped and the organisers went those extra miles in finding ways to keep things interesting, from a 30-seconds elevator pitch for each session before the start of day to a participants’ feedback session at the end of the day, to a games evening on Monday that really pulled the people together. A framework for organising on-demand sessions – called Birds of a Feather – helped to continue discussing a subject after the relevant conference slot was over. Overall I stayed inside the building continuously for 48 hours and there was no single dull moment, except when I was falling asleep because of the tiredness! Thanks to the organisers for creating a place for effective learning and thanks to all the people I met for the wonderful interactions. No need to say I will try to be there also next year!